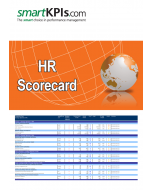 The HR Dashboard is a ready-to-use instrument for managing and measuring the contribution of the Human Resources function to the overall organizational performance. 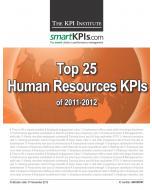 The tool contains a repository of the most relevant and widely spread HR KPIs used in order to track the HR services effectiveness and performance at organizational level. Dashboard - represents a repository of the most relevant HR KPIs used at organizational level, that reflect the HR department's contribution to the overall organizational performance. Data repository - contains accurate data collected in order to generate performance results on the main page of the Dashboard, with the most recent targets and progress on performance. 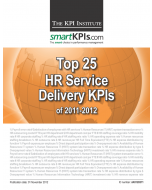 KPI catalogue - contains a detailed list of the HR KPIs monitored in the Dashboard - from KPI name to definition, subordinate measures, calculation formula, etc. KPI description - is a documentation file for each KPI, that supports an accurate and standard identification of the KPI, making it specific and inteligible for everyone using it. Linking tactical actions with performance results. Template customization support is provided by at cost by the smartKPIs.com team. 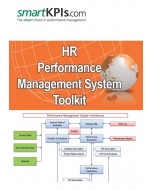 Buy now the HR Dashboard and benefit of this valuable resource immediately by downloading it electronically upon checkout! 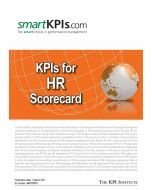 Complementing this template, the HR KPIs for Dashboard and Scorecard companion product, presents in a report format all the KPIs listed in it, with content exported from the smartKPIs Premium section of the website. Optimal performance data vizualization, using traffic lights and other visual aids. delivered was what I had anticipated to be."